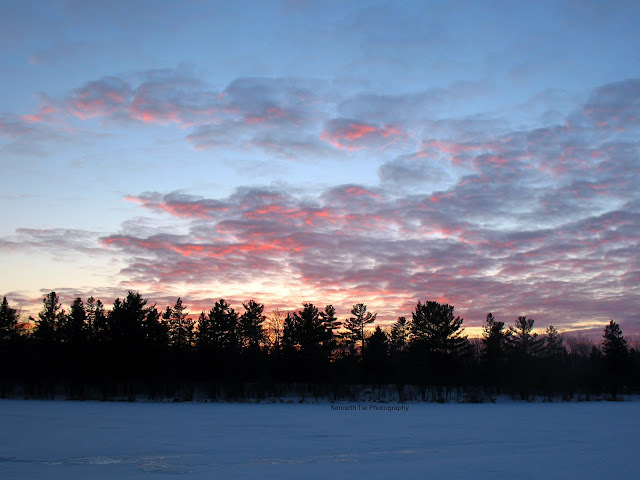 First ice is always unpredictable and requires knowledge of the waterbodies, experience, safety equipment and good judgement in order to return home safely. I fished a few spots around Ottawa with my friend Eli who knows the region well for the last few days of 2016 and the first day of 2017. Dec 29 We started the morning on Ottawa River so my friend Michael can catch his lifer Sauger. 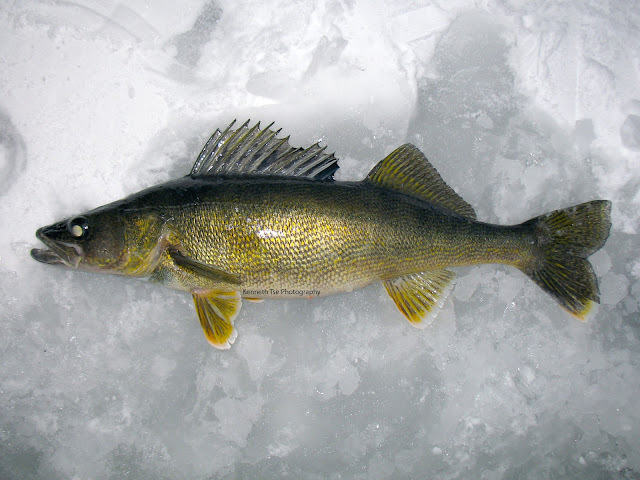 I hooked up with the first fish and luckily it wasn't a Sauger but an 8" Walleye. Eventually, after an hour or so, Michael finally caught a small Sauger. 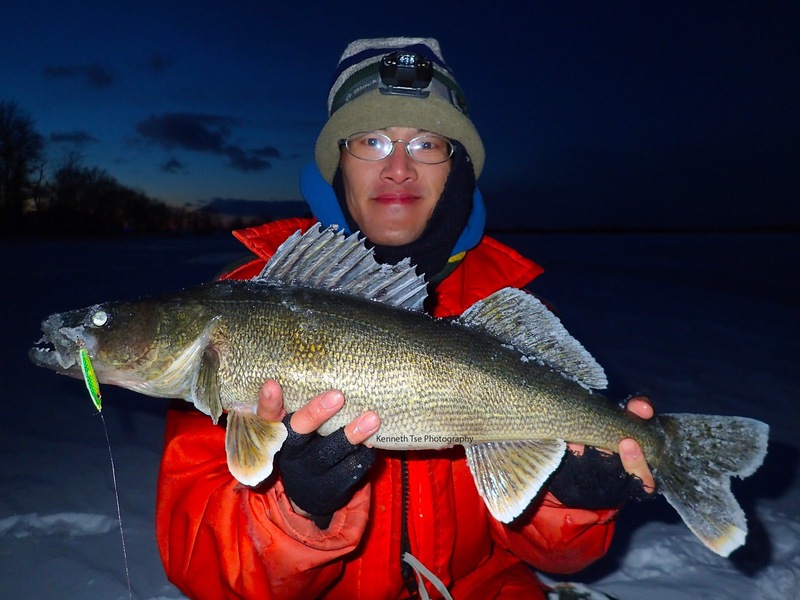 We decided to move to another location to try for Redhorse through the ice. Unfortunately, the ice was very inconsistent at this river location. The ice changed from 4" of black ice to 2.5" of black ice only 15 feet away. It was really scary. The current was also very strong under the ice. We stayed on the area with 4" of ice and didn't wander off. The strong current shut down the bite and we didn't even get a sniff. After a few good hours, we decided to return to Ottawa River. Fishing the Ottawa River for the rest of the afternoon, there were very few fish seen on the sonar. I managed a small Sauger while Michael caught a small Walleye. Eli missed a bite and that was it. It was a miserable bite all day. 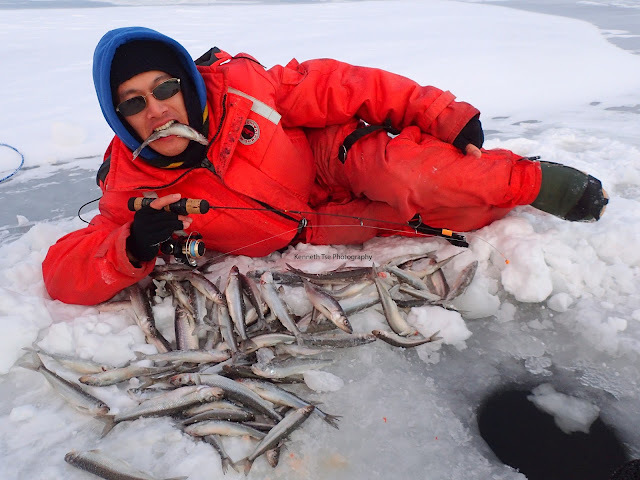 Dec 30 We wanted to fish a lake for Rainbow Smelt. Michael and I arrived by 9am while Eli arrived an hour later. We found 4" of black ice that was consistent throughout the lake. We started at 90 feet of water and didn't move all day. We didn't move because Rainbow Smelt schools were passing under us all day and we caught about 5 dozen of them, and the fact that it was blowing a wicked blizzard all day. Eli was fishing further away from us but didn't do as well, probably due to a combination of not having a rod with soft enough tip to see the delicate bite and the lack of minnows to tip the jigs. Later in the afternoon, after Eli left early, Michael and I fished shallower for Walleye or Northern Pike. Michael abandoned his hole at 20 feet of water so I took it. Upon the first drop with a minnow and spoon, a fish followed the lure up and took it. After a few runs, a 21" Walleye came up the hole. After that, I lost another fish on the next drop which was likely a Walleye. The drop following, it took just a few more minutes until I hooked up again and landed a 16" Walleye. The next couple of drops resulted in one more looker and one fish that ripped my minnow off. The action all came within a 30min period and then completely died. We fished until full dark and found our way back thanks to the GPS. Dec 31 Hoping for some better action, we fished a lake known to produce many smaller Northern Pike. Unfortunately, the bite wasn't as hot as expected, likely due to the unstable weather. 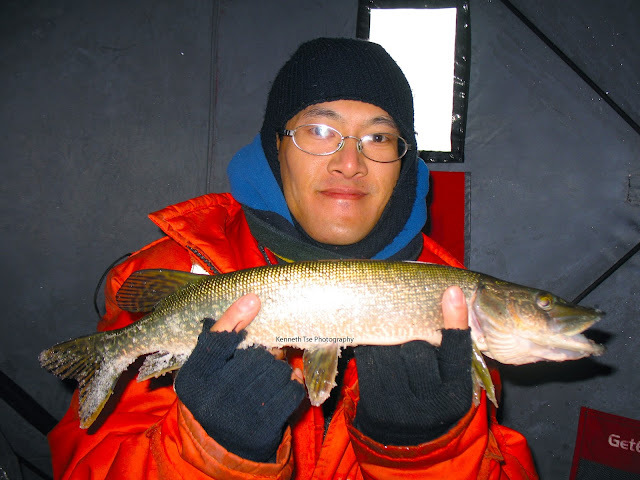 I did catch my first Northern Pike of this icefishing season by mid-morning. Eli then followed up not too long later with a Northern Pike of his own, and I finished up with another 20" Northern Pike. We added in a few Yellow Perch as well. Michael had a couple of Yellow Perch and that was his total for the day. Jan 1 After a night of celebrating, it was a late start. I didn't get on the ice until 10am while Michael had other plans with friends. It was a beautiful day that was clear, calm and warm. 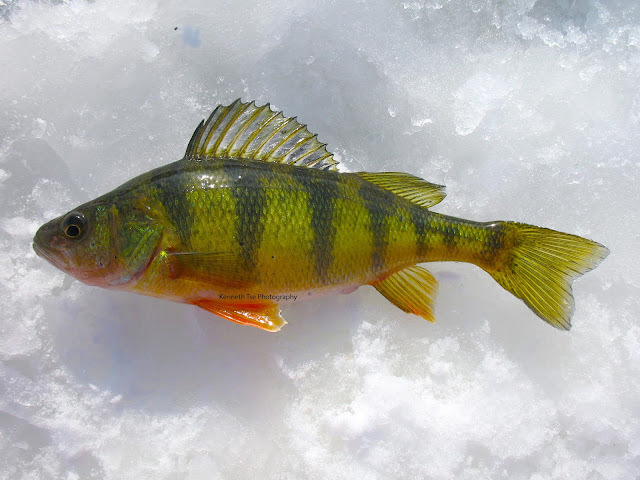 The fish were active, especially Yellow Perch up to 9". I was expecting the Northern Pike to be active as well, but only managed to catch one that was 23". By noon, clouds moved in and the bite completely stopped. Around 2pm, there was a little more fish movement under the sonar, but most were dink Yellow Perch except for this 8" Pumpkinseed Sunfish. 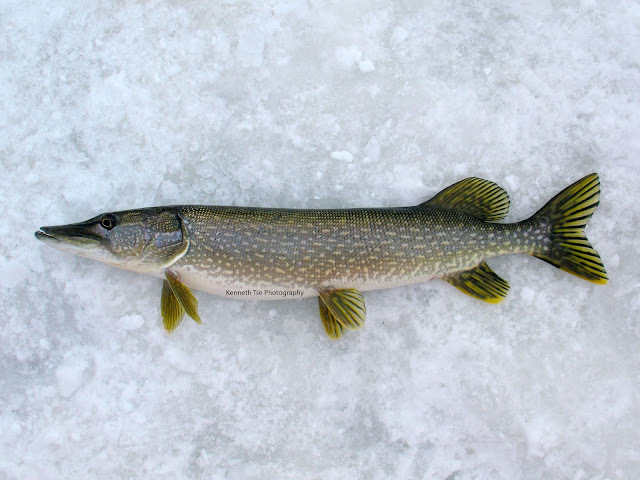 With the invasion of dink Perch, it meant that Northern Pike would not be nearby. In fact, that was how it went until dusk. 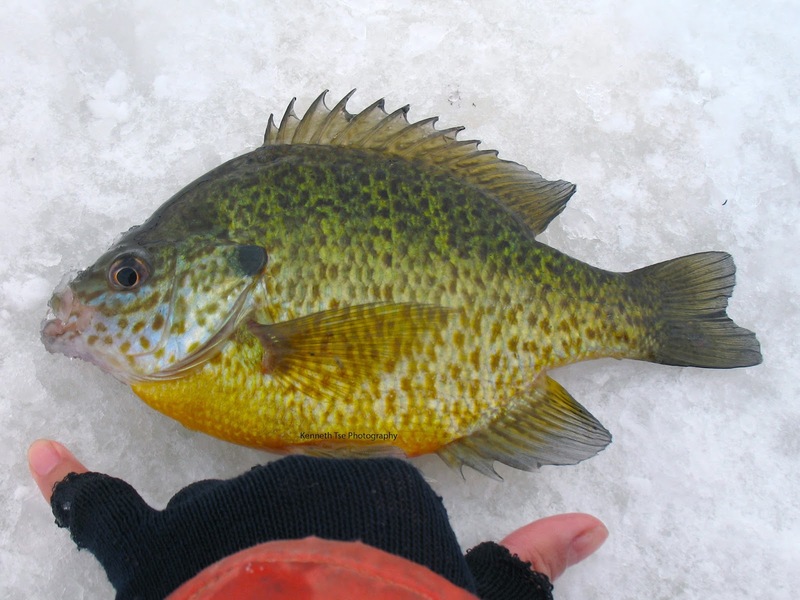 And so 4 days of icefishing came and went. It was a great way to close out 2016 with a couple of nice Walleye and 5 dozen Rainbow Smelt, and a great way to start 2017 with some fish caught. I look forward to see what else 2017 will offer!